The difference between these two images is so slight that I think I'll ramble on about the first picture for a bit while you puzzle it out. This is a shot of the Empire State Building, framed by the McAlpin House on the left, and the Wilson Building on the right. West 33 Street runs through the space in the middle. 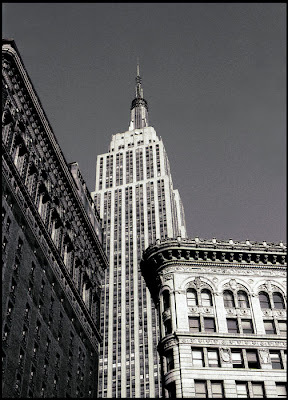 This is one of those pictures I vividly remember taking; even 22 years later I can recall stopping on the west side of 6 Avenue and staring upward while I got the camera from my bag. What drew my eye to it was the timelessness of the scene. 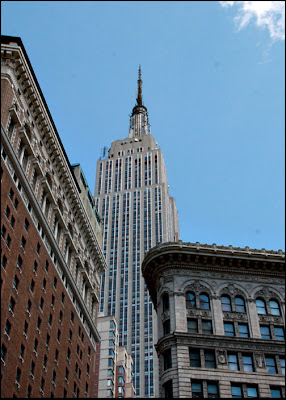 This is a view that hasn't changed since 1931, when the Empire State opened. (At that time, both the McAlpin and the Wilson had been on their corners of Broadway since 1912.) It gave me an idea for a series of pictures of New York scenes of the past, images that could be from the 30's, 40's, or 50's, but were contemporary photographs. In the mid-1980's there were still a lot of storefronts, buildings, even some intersections and neighborhoods could be shot in ways that, if the photographer were careful, would never give the viewer a clue as to the decade, let alone the year. Like a lot of things from that time, the idea remained merely an idea, and a few dozen pictures on a contact sheet. Little did I know that twenty years later I'd be dredging up this stuff with the opposite intent: showing the changes of the decades. So, have you figured out the changes yet? Well, like I said, they're very subtle. There's a new antenna on the Empire State, left side, on the penultimate setback. (I know, it looks like a bug climbing up, or something I forgot to clone out.) And there's a new building next to the McAlpin on 33 Street, a 34-story apartment tower which went up in 2002. Otherwise, not much has changed in the past seventy-six years.